While Israel gets crucified for killing actual Hamas terrorists trying to infiltrate into Israel, something far worse is happening in Turkey under the radar of the media and most "human rights" NGOs. [Deadly] incidents have become increasingly common in the past three years since Turkey ended the open border policy it adopted when the Syrian civil war broke out in 2011. 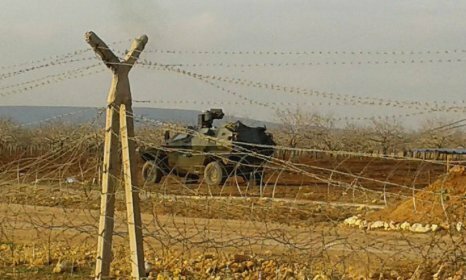 Since then, Turkey has erected a wall and fences along its 900-km border with Syria and sought to set up what it calls safe areas inside Syria for those displaced by the fighting. The Britain-based Syrian Observatory for Human Rights reported last week that it had documented more than 360 cases of Syrian civilians killed by Turkish border guards between August 2015 and April 2018. Those casualties include 68 children and 32 women, it said. Since the beginning of 2018, six civilians from the area of Ras al-Ayn have been killed and five wounded by Turkish border guards, according to officials at the local hospital where all of the victims were taken. Of the six killed, four died trying to cross the border, while the remaining two were targeted while working in fields along the frontier, the officials said. “I know three of the victims who died under torture after they were captured by the (Turkish) gendarmerie,” said Izedin Salih, a local reporter who closely follows the issue. He said the bodies of victims were dropped on the border by Turkish security forces and then picked up by Syrian residents or local authorities. Further west along the border, residents of the Syrian town of Tel Abyad said they had been living in fear after more than a dozen civilians were fired at by Turkish border guards while working in the fields in the past 10 months. At least three of them were killed, local sources said. A woman who went by the name of Um Sami told Ahval that her 62-year-old husband died at the local hospital in December two days after he was shot at by Turkish guards. The husband was working on his farm outside Tel Abyad when the shooting happened. Similar cases have been reported in Kobani, another Kurdish-held town on the Syria-Turkey border. At least six civilians were targeted, the Kobani Media Centre said. Turkey is doing exactly what the world is falsely accusing Israel of doing. Without the criticism. There are major music concerts planned for Turkey in upcoming months, including Wiz Khalifa, Joe Satriani, Liam Gallagher and Imagine Dragons. No one is calling on these artists to boycott Turkey because it kills hundreds of civilians a year just on the Syrian border alone - not counting what else it does.